When I saw this Labnosh meal replacement drink in Olive Young, I was quite intrigued since I was traveling soon and needed a quick airport/travel snack. This is great because all you need is some filtered water and you're good to go. It was about 4000KRW, I believe, so it's not too pricey. I had been trying out a few milk tea powders during my time in Korea, so I was a little iffy because this was 1) a milk tea powder and 2) a meal replacement. That being said, this was an actually pretty good meal replacement. It wasn't too chalky and wasn't too crunchy (you know how sometimes protein powders are crunchy and/or chunky). This one was relatively easy to mix and didn't get too chunky even though I only shook it to mix. The texture was relatively thick, so that's how you can tell it's a meal replacement drink and not just a milk tea beverage. The flavor was quite nice. It wasn't overly milky and you could definitely taste the tea flavor. It was a pretty nice black tea flavor. There were a handful of other flavors, some are more Korean than others. I believe there was a misugaru one, which is basically drinking grains. 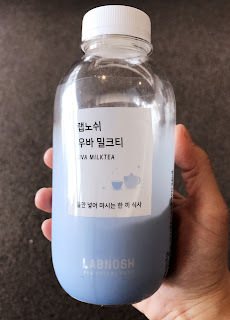 I was a little iffy about drinking that during a travel day (I do realize that the milk tea one was probably mainly grains), but I'd definitely consider trying that flavor in the future if given the opportunity. If you're just breaking into the meal replacement game, there is a chocolate option, but I was not about to try a Korean chocolate meal replacement because 1) I don't like chocolate and 2) it's probably super sugary/sweet flavored.